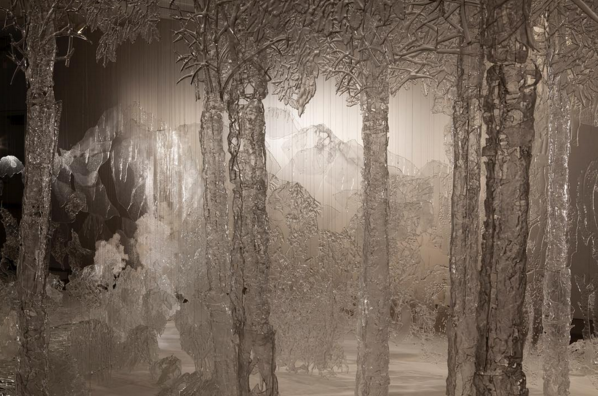 This weekend, Into the Deep opens at Museum of Glass. Celebrate the Museum’s new exhibition with a marine-themed token to remind you of your visit! For those who want to learn more about marine life, pick up a copy of Ocean: A Photicular Book for $25.95. Readers of all ages will enjoy the book’s Photicular technology, which transforms each photo into a moving 3-D image. 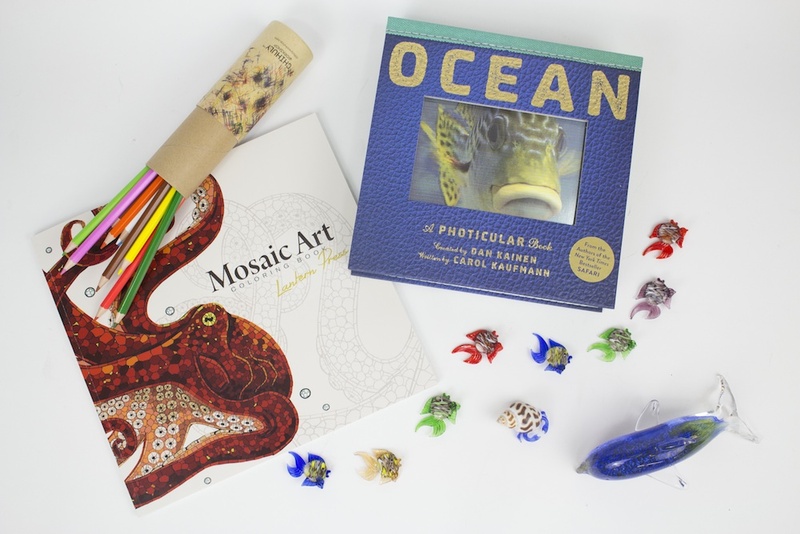 Our creative visitors should check out our selection of coloring and origami books, including Mosaic Art, featuring sea creatures, for $14.95. Suggestions: pair this with a set of Chihuly Workshop coloring pencils! You’ll even find a piece by Dale Chihuly in Into the Deep. Dale Chihuly (American, born 1941). Persian Sea Forms, 1988. Blown glass. 67 x 120 inches (170.2 x 304.8 cm). Collection of Museum of Glass, Tacoma, Washington, gift of George F. Russell, Jr. Photo by Terry Rishel. And of course there is plenty of glass available for purchase in the Museum of Glass Store. Add a little aquatic décor to your home with the Store’s variety of Global Village Glass Studio creatures. Choose from mini fish and hermit crabs for $10 or the larger dolphins for $30. Become a Museum of Glass member and save 10% every time you shop at the Museum Store. You’ll also enjoy extra seasonal discounts throughout the year! This entry was posted in Art, Exhibitions, Glass, Museums, Shopping, Store and tagged Dale Chihuly, exhibition, glass art, Global Village Glass Studio, Into the Deep, marine, Museum of Glass, Ocean: A Photicular Book on September 23, 2016 by Museum of Glass. Labor Day has passed, which means fall hours have arrived at Museum of Glass (MOG). It was another lively summer for the Museum, especially with the return of Night Blow. Here are some of the summer season’s highlights. Once upon a time, Museum of Glass hosted an evening event called Night Blow. This summer, the Museum decided to bring back the popular party and host two free Night Blows for the public to enjoy on those beautiful Pacific Northwest evenings. The first one, in July, invited visitors to enjoy glassblowing by Dan Friday and Courtney Branam in the Hot Shop, fire dancing on the plaza, and music by SoundAbout DJ. 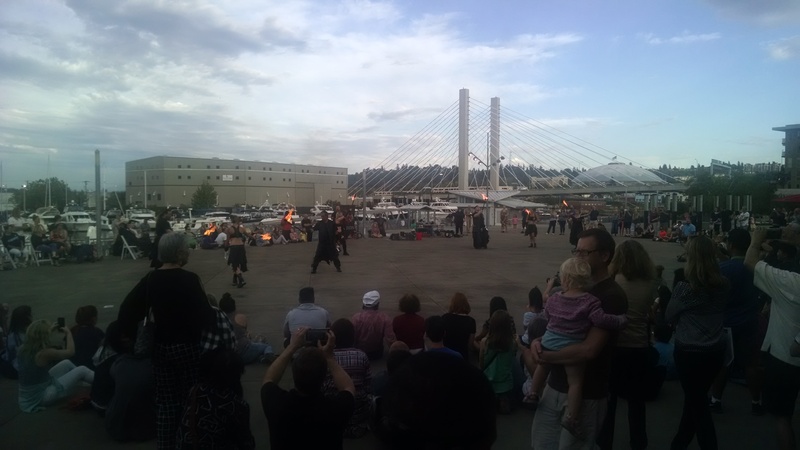 Next month’s Night Blow saw nearly 1,000 people visit MOG on Third Thursday to watch the Tacoma Glassblowing Studio team in the Hot Shop and flameworking on the plaza. SoundAbout DJ returned for the second Night Blow of the summer and Social Bar and Grill kept hungry guests happy with their food truck on the plaza. Night Blow guests gather to watch the fire dancing performance. Photo by John Ferguson. There’s nothing quite like watching the Maestro of glass art working in the Museum’s Hot Shop. In July, Lino Tagliapietra returned to MOG for another Visiting Artist Residency, and this time visitors were treated to something new—Tagliapietra’s Endeavor boats. 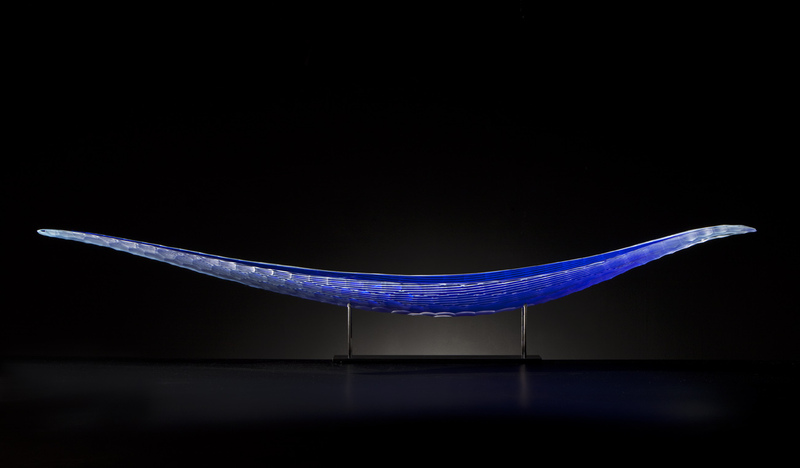 During his previous residencies, the Maestro and his team have worked with the Museum of Glass Hot Shop Team on a variety of vessels, but this time around it was all about the boats. Check out Hot Shop emcee Greg Owen’s earlier blog post on Tagliapietra’s summer residency. Russell Johnson Photographer, Lino Tagliapietra Inc. The Museum’s annual Red Hot Auction & Gala is just around the corner. To get ready for the September 17 event, Museum of Glass hosted its second Rev Up party. Artists, art lovers, and Museum of Glass patrons enjoyed an evening at Seattle’s Glass Distillery, where guests began to get red carpet ready for Red Hot. Tickets to the annual gala, featuring a gourmet dinner, live and silent auctions, and an after party with Ethan Stern, are available online. See more photos from Rev Up here. Summer may have come and gone, but there’s still plenty to look forward to this year. 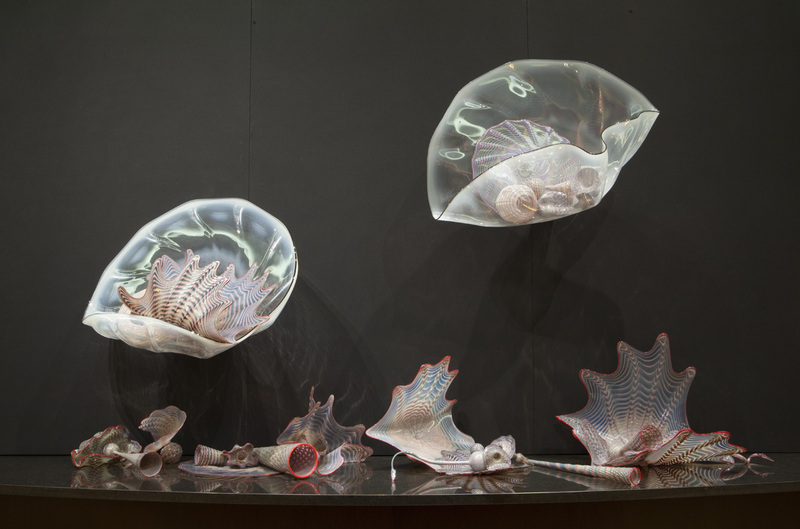 I’m personally excited for the opening of the Museum’s new exhibition Into the Deep, seasonal hands-on glassmaking workshops, and, of course, more Visiting Artists! 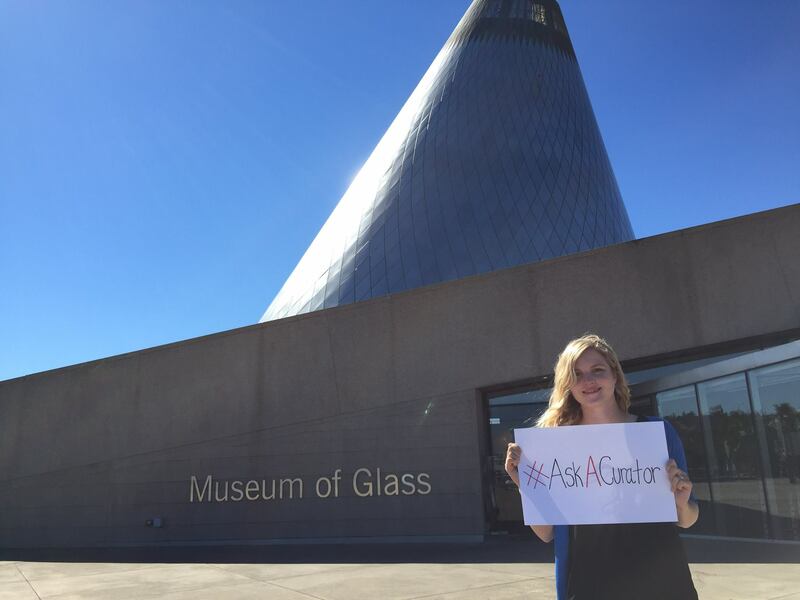 Alex Carr is the Communications Manager at Museum of Glass. When she’s not circulating the Hot Shop floor trying to get the perfect Instagram shot for the Museum, you’ll find her baking at home, running at Green Lake, or exploring Washington’s wineries. 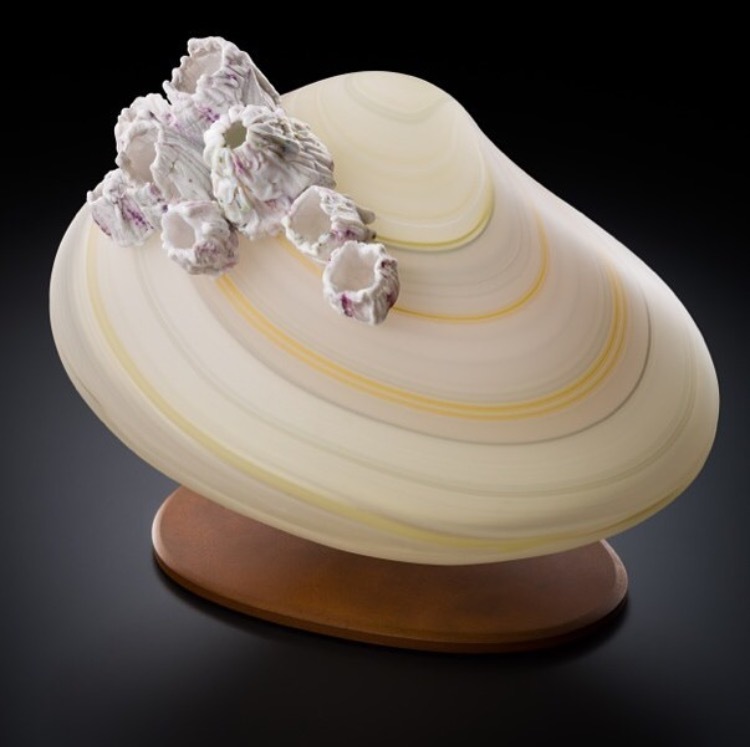 This entry was posted in Artists, Events, Museums and tagged flameworking, glass art, glassblowing, Lino Tagliapietra, Maestro, Museum of Glass, Night Blow, Red Hot, Rev Up, Social Bar and Grill, SoundAbout DJ, Tacoma on September 9, 2016 by Museum of Glass. 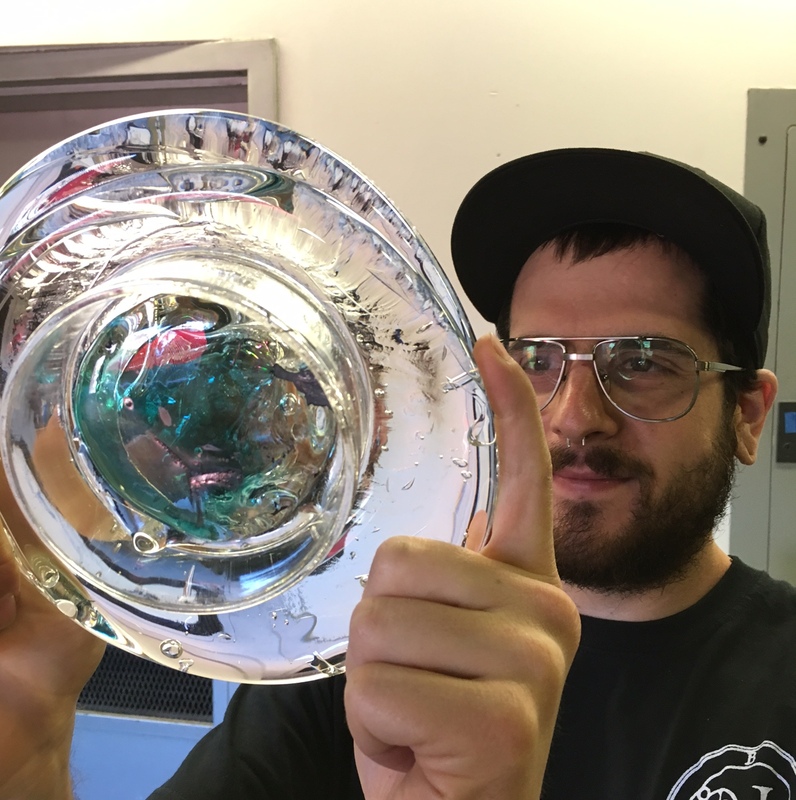 Last week metals and jewelry artist Bryan Kekst Brown came to Museum of Glass with some very interesting projects. We began the week creating tanks for electro-forming metal. This was the first time that electrodes have been attached to glass at Museum of Glass, as far as I know. It provided a special challenge for the Team’s gaffer, Gabe Feenan, as the electrodes are encased in borosilicate glass, while ours is soda-lime glass. At first they didn’t want to stick together nicely, but Gabe persevered and made it work. Things started heating up when Bryan decided to pour liquid metal into a cup of liquid glass. He began by melting strips of copper in a small crucible with an oxy-propane torch. 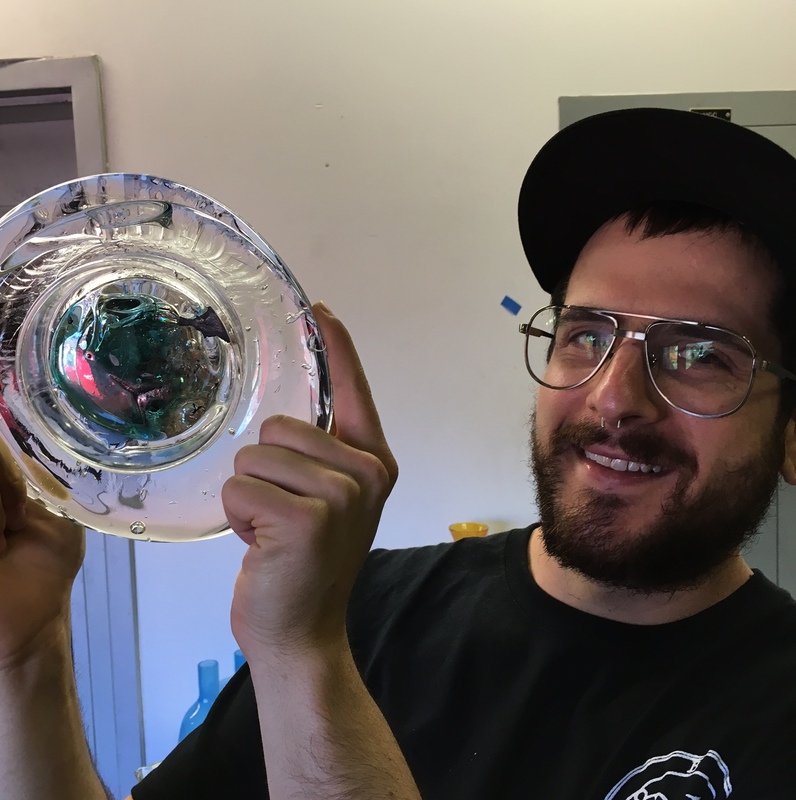 At the same time, Gabe made a cup of clear glass, and the Team’s starter, Sarah Gilbert, used the gathering ball to pull some liquid glass from the furnace. In quick succession, Gabe broke the cup off and placed it on the table, Sarah dumped her gathers in, and then Bryan poured the liquid metal inside. It was very exciting! Next, Bryan began melting ingots of silver in the same manner, and the Team repeated the process. It was very interesting to see how the metals behaved in a bath of liquid glass. We found this so interesting because copper and silver are common colorants for metal. Copper is known to make ruby, green, and blue glasses. Once the piece cooled down, we were happy to see that there was a lovely cloud of copper blue, where the metal had slid by the glass, and a big pile of copper at the bottom of the cup. Silver is known to make yellow glass and shades of blue as well. The first attempt resulted in shattered glass around the silver, but the second attempt was successful, and left a wonderful bit of opaque blue as a record of what happened. I look forward to seeing Bryan’s experiments in the future. If you would like to see more of his work, check out his website http://www.bryankekstbrown.com/. He will be posting images from his residency over the next few weeks. Greg Owen is the Manager of Audience Engagement and Hot Shop Heroes at Museum of Glass. Greg can be seen working the mic as the Hot Shop studio emcee, assisting Visiting Artists, and teaching soldiers how to blow glass during Hot Shop Heroes: Healing with Fire classes. This entry was posted in Art, Artists, Glass, Hot Shop, Museums and tagged borosilicate glass, Bryan Kekst Brown, copper, electrodes, Gabe Feenan, Metal, Museum of Glass, Sarah Gilbert, silver, soda-lime glass on September 2, 2016 by Museum of Glass.